Denis Curtin was born, according to his own testimony, on May 13, 1833. He stated this to one of his confreres on May 13, 1916, some months before his death. His birth took place at Emly in County Tipperary, Ireland. He immigrated to the United States and worked for some years in Troy, New York, as a shoemaker. He was vested at Villanova, Pennsylvania on May 7, 1893 with the name Brother Francis Xavier, and was professed on October 7, 1899. Solemn Profession followed on November 7, 1902. For many years, Brother Francis exercised his craft very skillfully as shoemaker at Villanova. 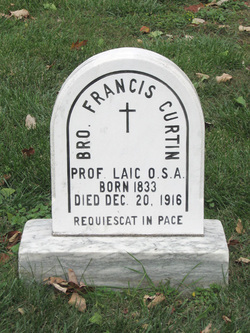 He died at Villanova on December 20, 1916 at the age 83. He had been ailing for some years with stomach and heart trouble. The Solemn Requiem Mass was offered by Villanova’s President, Father Edward Dohan, O.S.A. on December, 22, 1916. Burial followed in the Community Cemetery at Villanova. Newer Post John P. Gilmore, O.S.A. Older Post Thomas F. Gilligan, O.S.A.